Acer Predator is coming to PAX West! 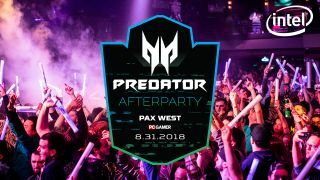 After you've played some games, watched a few panels, and explored the PAX show floor, head over to the Predator Gaming After Party at The Showbox on Friday, August 31 starting at 9 pm. You can get your hands-on the latest Predator gaming hardware powered by Intel, watch an epic musical performance by A-Trak, pick up exclusive swag, play games, and grab a few drinks. Hang out throughout the night for the Play like the Pro’s gaming competition, exciting giveaways, and more! Register for your ticket now! Register before August 27 and join the party! *Entrance will be granted on a first come, first served basis for those who show an electronic ticket provided after registration or flyer and US identification.